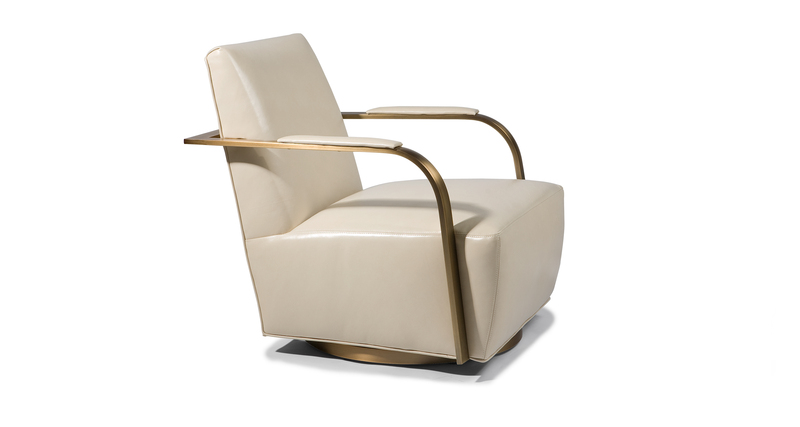 The Zac swivel chair is one of our new modern classics designed by Ransom Culler. Zac features crisp tailored upholstery, a memory swivel base and sleek metal arms and base available in either brushed stainless steel (No. 1086-113) or brushed bronze (No. 1086-113-B). Choose from any of our many in-house curated fabrics or leathers or provide COM. Shown in brushed bronze finish. Base and arms available in brushed stainless steel (No. 1086-113) or brushed bronze (No. 1086-113-B). Memory swivel base standard.